Cops using steriods and a police chief covering for them!Â The more we look at steriod usage among the police forces, the more engrained the behavior appears to be. In this case, it wasn’t just the cops, this bust involved fire and rescue personnel, corrections officers, and university security staff. PARENTS, is anyone reading this series of articles is column surprised any more that our kids are getting the message that it’s “OKAY” for them to use anabolic steroids?Â Heck, it looks like all of the local public services officers in some communitiesÂ may beÂ involved with these drugs. Canby businessman William Jake Traverso (center) appeared in court inÂ Clackamas County in March. 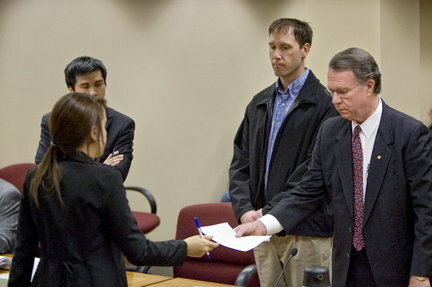 Prosecutor Michael Wu is on the left, and Traverso’s attorney John Henry Hingson III is to the right.A federal inquiry into steroid abuse by a Canby officer and a cover-up by his chief has stretched to other law enforcement agencies, thanks to the cooperation of man who supplied the steroids:Â Canby resident William J. Traverso, who has admitted to selling steroidsÂ to other officers in the Portland area. Traverso, one of the central figures in the Canby steroid abuse inquiry that putÂ former Officer Jason DeasonÂ in jail and spurred Chief Greg Kroeplin’s resignation, sought a lenient sentence Monday because he’s been helping the FBI. The federal investigation already has prompted the resignation of four law enforcement officers who also have lost their police certification — Deason, Kroeplin, Washington County narcotics dog handler Jared Gochenour and West Linn Officer Jess Riley.